My son and I got an early start Saturday, but when we pulled up to the trailhead at Purisima-Higgins Road, it was already full. Luckily there are quite a few places to park outside the gate, so we were quickly on our way. For the first hour we saw only banana slugs and occasional clusters of cyclists. We began to count the colorful slugs, and made guesses how many we'd see. By the time we reached the junction with Borden Hatch Mill Trail, we'd already seen 67 (since I couldn't find a pen in my backpack, I made notes on my phone). It was a peaceful morning, and we heard an owl hooting off in the distance. 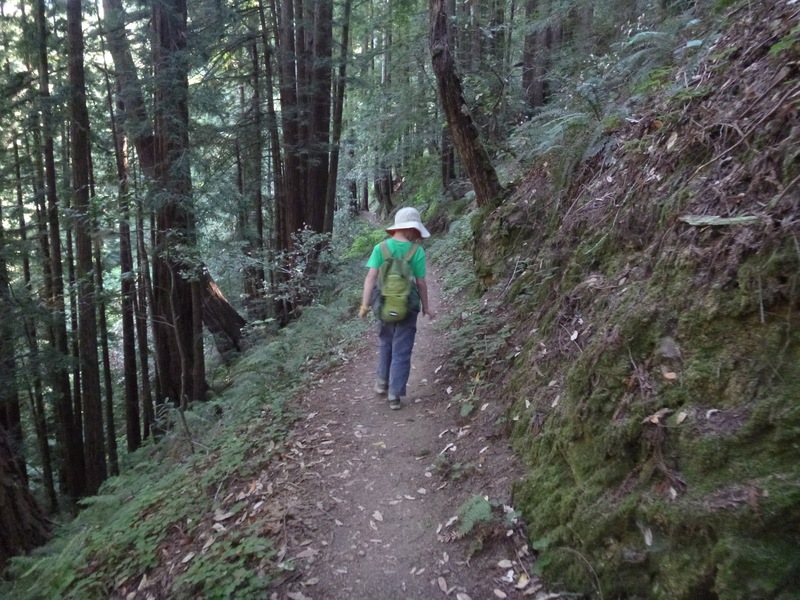 The sides of the fire road seemed to glow a lush green, and Purisima Creek, though low, murmured along us as we climbed through redwoods, maples, California bays, and oaks. Harebell (Campanula prenanthoides), sugar-scoops (Tiarella trifoliata), and helleborine were in bloom; these flowers are usually the last notable bloomers of the year in these woods. At 2.3 miles we left the fire road and began hiking on Craig Britton Trail. 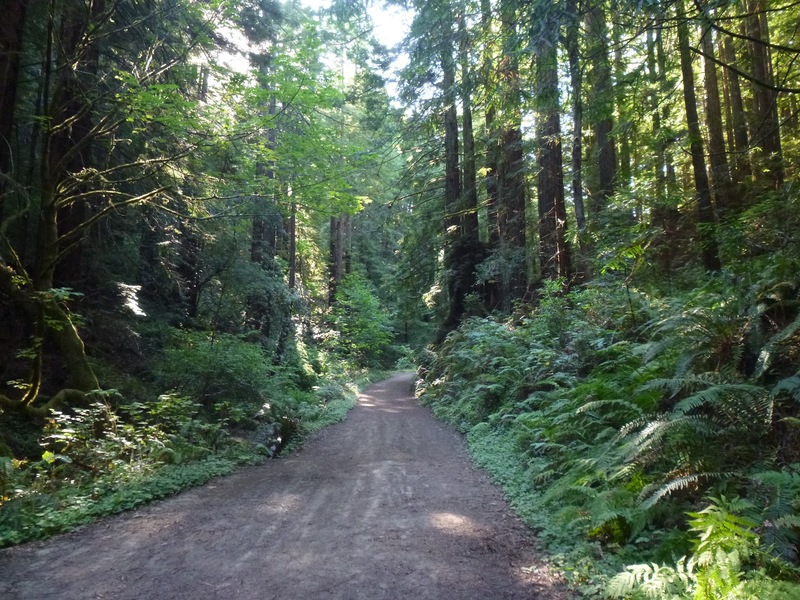 This narrow single-track starts out winding through redwoods and Douglas fir -- it is one of my favorite trails. We stopped for an early lunch near a redwood fairy circle, then pressed on uphill out of the trees into coastal scrub. The trail was nicely groomed and brushed, so we had enough room to hold hands side by side here. Out in sun it was hot, so my son distracted me with a story from his daycamp counselor, about a boy who wakes up with popcorn kernels on his head. 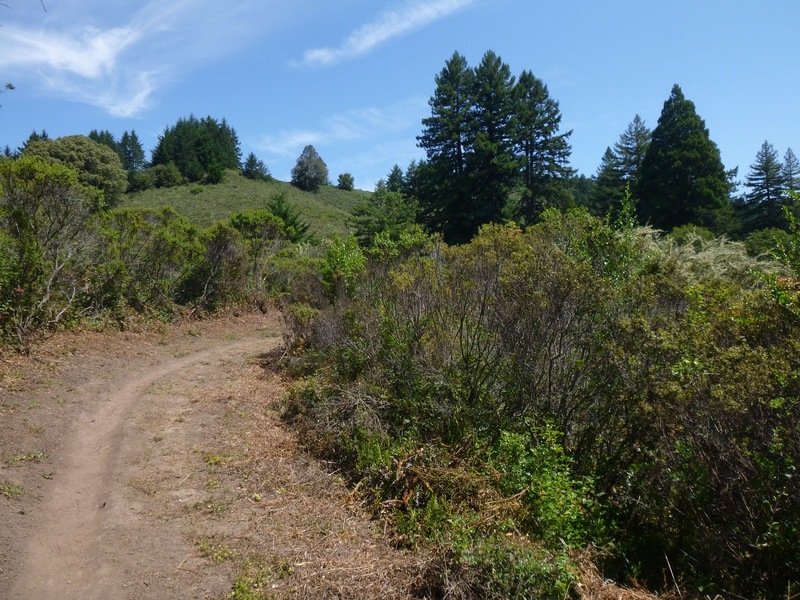 We passed through a gorgeous area with coast live oaks and Douglas firs mixed through coyote brush and coffeeberry, then made the final push to the junction with Harkins Ridge Trail. I had warned him that our final 2 miles would be steep, but it turned out I was the one griping about the descent. We passed about 40 hikers in small groups ascending, some of whom were grim-faced and clearly not enjoying the climb. 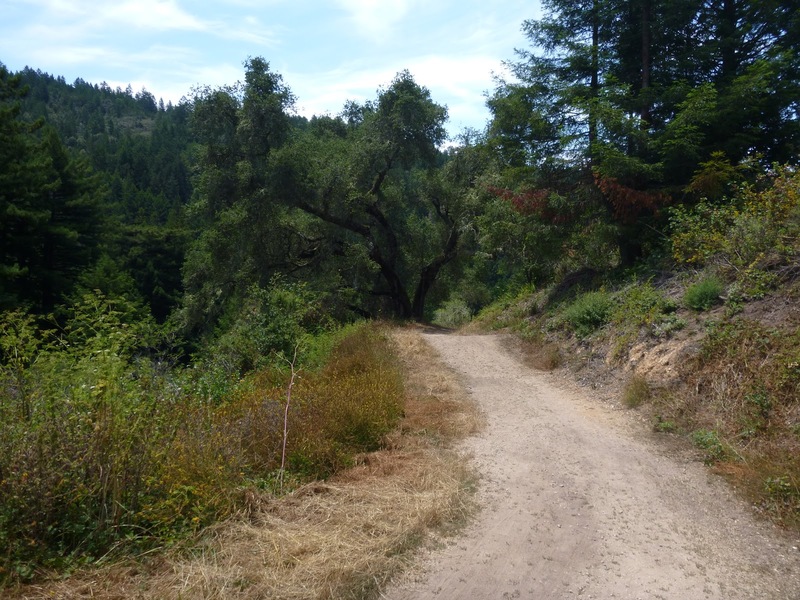 I day-dreamed about my fantasy trail, a path heading north that would connect to Whittemore Gulch Trail. Always while descending Harkins Ridge I wonder if I should have pressed on to Whittemore Gulch Trail. This option is 2 mile longer but requires more climbing. Maybe next time. We stopped for a final water break under a coast live oak, just 1/2 mile from the trailhead. The cool shade felt great as we slumped along back to the trailhead. 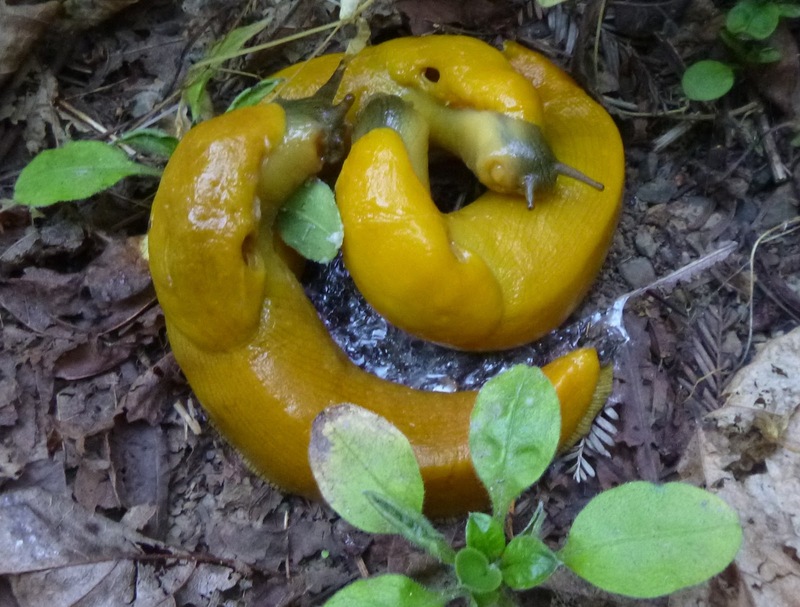 Tired and happy, we tallied our banana slug count: 134!